On February 3rd, Bellingham Technical College hosted the 33rd annual Focus on Children conference. 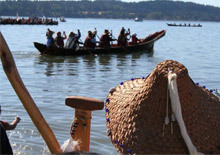 The conference, which draws early childhood educators from a five-county region and over five Tribal Nations, is designed to: (1) provide professional development and networking opportunities to those working with young children and families; (2) promote inclusive attitudes and practices and support awareness of and action related to diversity issues; and (3) support partnerships and collaboration among educators, families, providers, school, agencies and our communities. All Northwest Indian College (NWIC) Early Learning Center (ELC) staff, including teachers and administrators, were in attendance at this year’s conference. Dr. Anna Lees, a descendant of the Little Traverse Bay Band of Odawa Indians, an Assistant Professor of Early Childhood Education at Western Washington University, and a member of the Restorative Teachings Early Childhood Education (ECE) Initiative Coordinating Team, gave the keynote presentation. Dr. Lees’ presentation, entitled Enriching Early Childhood Education with Indigenous Community, School, and University Collaboration, focused on school-community partnerships, highlighting ways in which early childhood educators can collaborate with local Tribes to enhance education for not only Native children, but for all children in grades Preschool through 12. 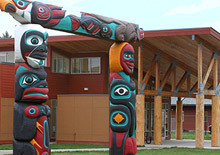 Dr. Lees featured Northwest Indian College’s Restorative Teachings ECE Initiative in her keynote presentation as an example in practice, underscoring the various ways in which NWIC's ECE degree program has engaged parents, teachers, tribal leaders, and community members to strengthen systems of care and learning for Native children and families. Nahrin Aziz-Parsons, Restorative Teachings ECE Initiative Project Director, later chaired and facilitated a breakout session, entitled Fostering Whole Child Health and Wellness in Indigenous Education: Engaging in Experiential Education to Learn about Coast Salish Ways of Life, to contextualize this information locally.She and members of the Restorative Teachings Coordinating Team, Dr. Anna Lees, Cynthia Wilson (Lummi scholar and elder), and Alicia Allard (NWIC ELC Director), presented on our project and its three efforts: (1) curriculum reform, (2) nature-rich, place-based Outdoor Learning Classroom, and (3) site-embedded, relationship-based professional development. We concluded the workshop by engaging attendees in a discussion, during which they identified ways in which to engage Native families and Tribal Nations in launching projects and initiatives in their respective communities. 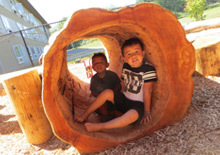 Article written by and photos courtesy of Nahrin Aziz-Parsons, M.Ed., Lead ECE Faculty, Restorative Teachings Project Director, and Focus on Children Conference Planning Committee Member.